Herb Halperin: The Sky’s No Limit! Herb Halperin’s handsome hardcover book blends his lifelong love of flying, his natural sense of adventure and his memorable observations about the world. Call it pure perseverance. 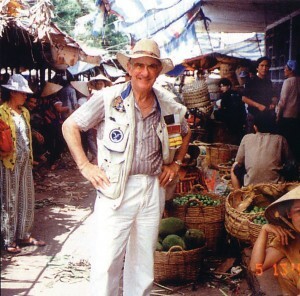 As he turns 84 this month, Herb Halperin is reflecting on a life well lived and adventures that have taken him all over the world. A Navy veteran of WWI, an aviator, engineer and world traveler, Halperin’s efforts to advance military technologies have led him from the atomic wasteland of Nagasaki to the very edges of space with the Strategic Defense Initiative (“Star Wars”) program. More recently, he participated in the 1994 around-the-world air race sponsored by the French organization Arc en Ciel. 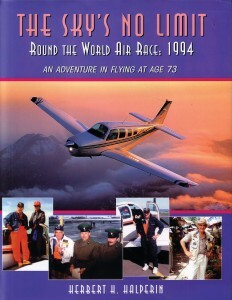 His newly published hardcover book, “The Sky’s No Limit,” chronicles his adventure in flying around the world at the age of 73, and includes his memories of World War II, as he flew over the South Pacific theater, as well as his distinctive impressions of the world’s most exotic cultures. His first memories are of an aviation legend. In 1927, when Halperin was just 6 years old, his father took him into New York City to see Charles Lindbergh. By the time Halperin graduated in 1942 from the Guggenheim College of Aeronautical Engineering of New York University, he was well on his way. After graduation, he joined the Koppers Company’s Aeromatic Propeller Division in Baltimore where he created advanced propeller designs still in service today. But after a period of time, the Navy expressed a need for additional officers and Halperin applied for and was selected as an ensign. After officer’s indoctrination at Princeton University, he was sent to Pearl Harbor to join a submarine tender headed out for the South Pacific theatre. Halperin spent a year and a half in the Philippines, Marianas and Okinawa, where he ended up in anticipation of an American invasion of the Japanese mainland. Involved in the initial occupation of Japan, he had the rare opportunity to go ashore at Nagasaki, where the second American atomic bomb had wreaked havoc. Halperin went on to have an energetic and rewarding career designing weapons and combat systems for companies supplying the U.S. Navy. He was a principal in the initial development of the Sparrow air-to-air guided missile. Later, he achieved recognition for his contributions to the Navy’s antisubmarine warfare capabilities. During that time, he was a regular visitor to the vice admiral’s commands in Hawaii, Virginia and Washington, D.C. He distinguished himself by joining fleet activities aboard Navy aircraft carriers such as the “USS Ranger,” where being catapulted off the deck, he participated firsthand in ASW exercises. “That was invaluable experience. Later, as I came face to face with authorities in Washington, my contributions were more readily accepted because I had been there,” Halperin said. As a director for Litton Industries in 1978, he led the design of the total combat system for the Navy’s new Spruance-Class destroyers. Following that, he established a new division creating automation systems for maritime supertankers and container ships. He formed his own consulting company in Beverly Hills, Calif., to represent large aerospace companies such as Rockwell International and Hughes. At its inception, he became active in the Strategic Defense Initiative. He’s had an extraordinary career; the engineer says it was always about the work. Along the way, Halperin kept up with his interest in flying. He had first soloed in February 1940, but his heavy workload kept him from his single-engine commercial rating until 1952. As his workload slowed down and Halperin began to think about retirement, he started thinking about a new adventure. In September 1993, he read in AOPA Pilot that Arc en Ciel was planning an air race for the following May. After following up with the American contact, Halperin partnered with Dr. Wilfred Tashima of Honolulu, Hawaii, who had a Beechcraft A36 Bonanza that was capable of the flight. Herb Halperin’s most memorable experience was visiting Ho Chi Minh City in Vietnam more than 30 years after the end of the Vietnam War. They set off from Montreal, Canada, on May 1, 1994. Halperin recorded his observations on the 24-day, around-the-world journey on a small tape recorder he kept with them at all times. They competed with 12 additional entries, including pilots from the U.S. as well as France, India, Spain, Belgium, Norway and Switzerland. The race itself had its share of heart-stopping moments. Those incidents included a bird strike right out of St. John’s, Newfoundland, which caused minor structural damage; a complete instrument panel power failure in Istanbul, Turkey, which almost knocked the two pilots out of the race; and an electrical storm in Thailand. However, the scariest leg was a major icing problem that occurred after 13 hours of flying across the Pacific, heading to Alaska. Although Halperin’s career has taken him all over the world, he still got to set down at some of the world’s most unusual and exotic destinations as part of the race. The course went through Morocco, Italy, Greece, Turkey, Syria, Jordan, Saudi Arabia, India, Thailand, Vietnam, Japan, Russia and Canada. The race took him to cities like Istanbul and Dubai, into the Mekong Delta and back to his old wartime stomping grounds in Okinawa. It’s a rich story as he describes a quiet early morning visit to the Taj Mahal in India, dining in Marrakech, and revisiting the Vietnam War. It took him almost 10 years to write “The Sky’s No Limit,” working from long transcriptions of his observations and finally publishing 775 copies himself. It’s a compelling story, rich with storytelling and narrative detail about places few pilots can fly through in today’s more complex world. At its core, it’s a story about overcoming adversity and the accomplishments that people can achieve by working together. 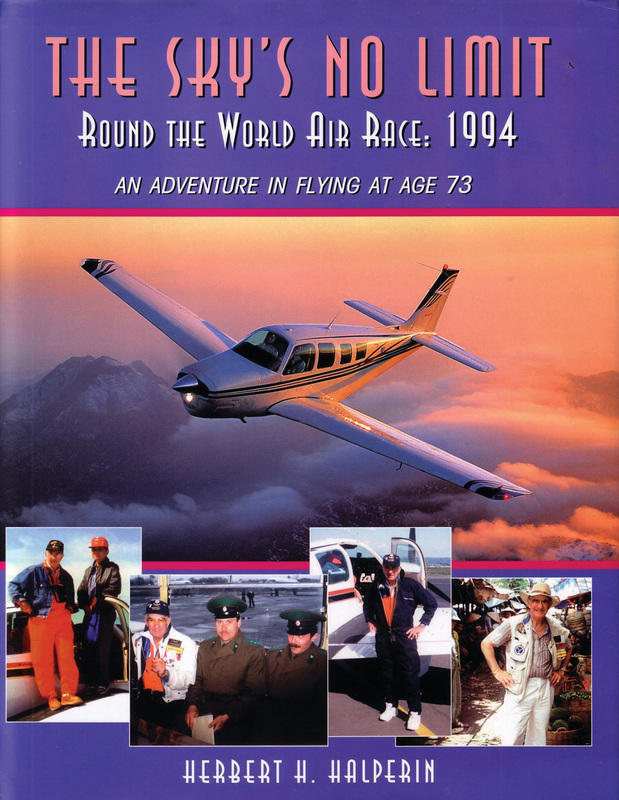 “The Sky’s No Limit: Round The World Air Race 1994, An Adventure in Flying at Age 73,” by Herbert H. Halperin, is available from Medallion Enterprises by calling 800-597-9250 or emailing orders@medallionenterprises.com.